Research* shows that almost 90% of Brits are concerned by the UK’s plastic usage and 70% of respondents in Wales are willing to see a similar 5p plastic bag ‘charge’ applied to other single-use plastics. A 10-metre whale – made from the same amount of plastic dumped in the ocean each second – visits Cardiff Bay for the Welsh public to see. 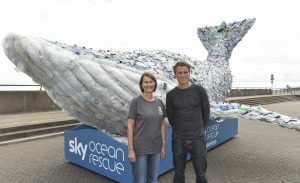 The whale was met with great support from former British Olympic rower, James Cracknell, and Keep Wales Tidy Chief Executive, Lesley Jones. The plastic whale will tour the UK as part of the Sky Ocean Rescue campaign, encouraging the public to make changes to their plastic consumption. An independent survey commissioned by Sky Ocean Rescue has found that 87% of Brits are concerned by the UK’s plastic usage and 70% of respondents from Wales are willing to see a similar 5p plastic bag ‘charge’ applied to other single-use plastics, such as straws, bottles and cups. The research highlights a growing awareness around the issue of ocean health, and a desire from the Welsh public to see behaviour change, including incentives to discourage plastic usage, as over eight million tonnes of plastic pollution continues to enter the ocean globally every year. In a bid to further drive awareness and inspire members of the public to make changes to their own plastic consumption, a 10-metre plastic whale has appeared in Cardiff. 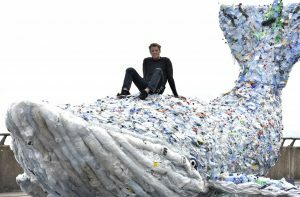 The whale is made of plastic bags, bottles and other single-use plastics pulled from the ocean, beach cleans and local recycling plants, and represents the same amount of plastic that pollutes the ocean every second. A report by researchers Resource, earlier this year reported that Wales was the third best recycling nation in the world; however, research shows that 85% of the country have still witnessed rubbish left on beaches or floating in the sea. The Plastic Whale Tour will travel through England, Wales and Scotland, visiting iconic beach and water front locations as well as city centres. The campaign will also give members of the public tips on small and easy changes – from using a refillable plastic bottle, to saying no to straws and plastic bags – helping reduce plastic consumption. More details are available at www.skyoceanrescue.com. Find out more about the Plastic Whale Tour and the issues affecting our oceans at the Sky Ocean Rescue Facebook page, @skyoceanrescue on Twitter, or visit skyoceanrescue.com.